Chrysoberyl occurs in a range of colors, from green, greenish yellow to brown. It is hard, durable stone, particularly suitable for jewelry. It has a mohn's rating of 8.5 which makes it the third hardest natural substance. Only diamond and corundum (sapphires and rubies) have a higher mohn's rating. The name chrysoberyl is from the Greek chrysos, meaning golden, and beryllos, which refer to the beryillium content. Known for thousands of years in Asia, it was highly valued for the protection it afforded from the "evil eye". Chrysoberyl in mainly found in Brazil, Sri Lanka, Madagascar and recently in Tanzania. Chrsoberyl is usually very transparent with high brilliance but some have numerous fine, parallel crystal needles, cut in cabochon they produce a cat's eye effect that is quite lovely. 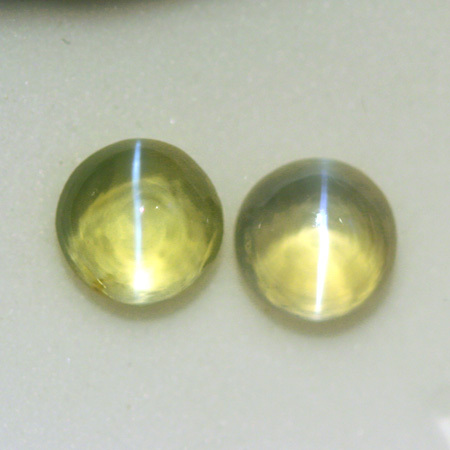 Chrysolberyl with a cat's eye is very rare and costs more in the market than the transparent gems. Both are excelent choices for all types of jewelry and are highly prized by collectors too. Beautiful yellowish green color with strong asterism. Excellent cut ad polish. Transparent clarity.